Winter makes me lazy. When I don’t have a legitimate reason to go out, I find it hard to kick myself from under the blanket. So on especially lazy days, I have to force myself out. One method that works almost all the time is checking out some good movies in one of the indie theatres around town. 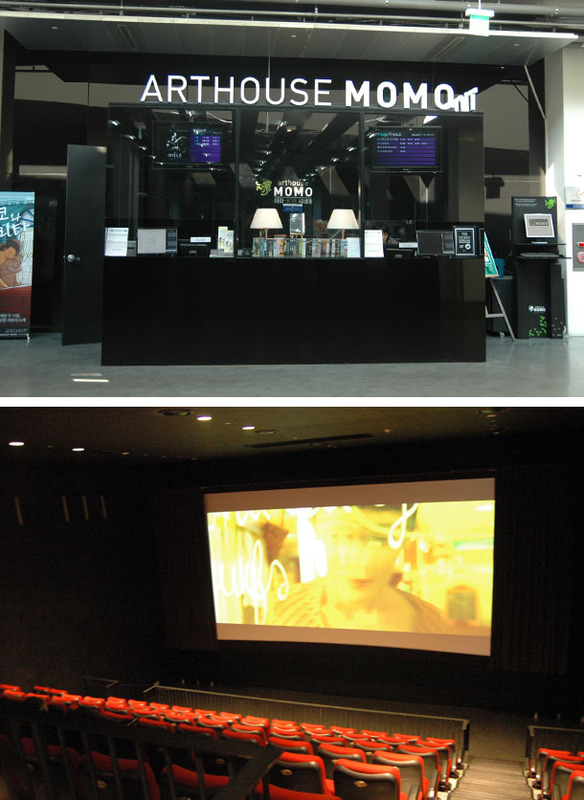 Arthouse MOMO and Cinecube are small but convenient cinemas to begin with because they have easy access to subways and buses. Their selections usually include art films, indie films, low budget films, foreign films, and some thoughtful Hollywood films. In a country like Korea where everybody watches the same popular TV shows, the same blockbuster movies, and listens to the same popular music, these kinds of small theatres are a breath of fresh air. Though I also love watching those popular TV shows and mindlessly entertaining blockbuster movies, sometimes I need a break. The comfy red seats of these theatres are a haven for people like me. 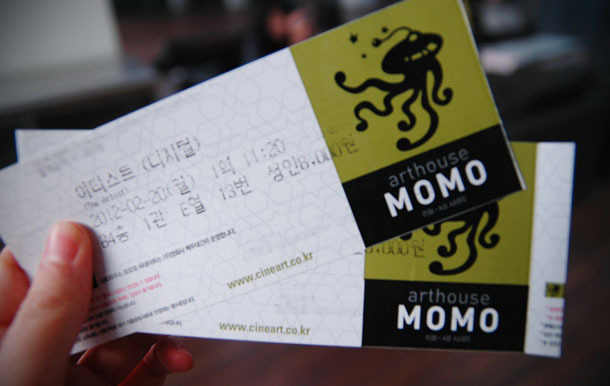 Arthouse MOMO is a small cinema inside Ewha Womans University campus. But don’t worry–men are allowed. The theatre often holds film festivals, viewing events, and discussions. Last time I had a chance to attend the Seoul International Architecture Film Festival and encountered impressive documentaries like Megunica (2008) and Building 173 (2009). Cinecube is in Gwanghwamun, at the center of the city. The convenient location and some interesting artwork displayed in the building lobby, including the famous “Hammering Man,” make Cinecube an attractive place to visit. 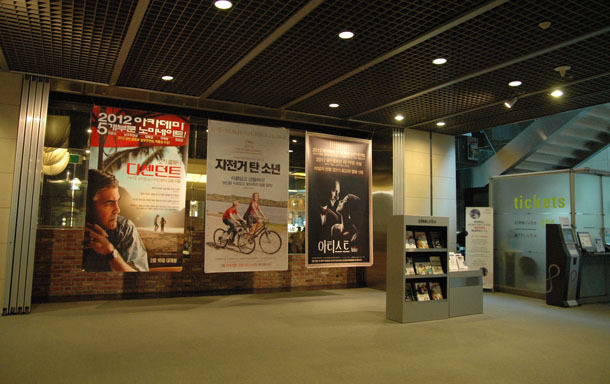 They also offer many opportunities to watch Korean art films and host Asiana International Short Film Festival every year. Unlike multiplexes, where most people come to hang out with each other, these indie cinemas are geared toward people who really want to concentrate on the movies. Therefore often the viewing experience is quiet and intimate. Their no popcorn policies help. But the best thing is that nobody leaves the theatre until all the credits have rolled. That is pure love. This week I ended up watching two movies: The Artist (2011) and The Descendants (2011). Both really well-made films. I highly recommend The Artist to those especially learning film and film history, or anyone who wants to see how it’s possible to entertain people without 3D or CG effects, sound, dialogue, and color. Fascinating. This entry was posted in Do, Seoul and tagged art, do, explore, films, justine, movies, theatres. I know what you mean about wintry days and hibernation. Instead of indie theaters, I have DVD stores that are fully stocked with new releases! Wow I can’t remember the last time I was in a movie theatre and that happened! That is a true sign of respect for cinema.